So it has somehow been a whole week since I published a blog post and that means it’s time to publish another one. I was hoping to have painted something by now, but that just didn’t happen. I peeled the dried acrylic paint off my plastic palettes. That’s about as close as I got to painting this week. The weather has been mostly gray and that hasn’t helped my mood. It’s gray again today and I know I really can’t complain because I live in Florida. I’m not fighting ice and sleet and snow. It’s just a little misty out there. And chilly. Misty and chilly. It’s not as if I’m snowed in. Misted in? No, I can just put on a coat and some boots and go wherever I want to go – especially since my daughter replaced my windshield wiper blades for me a couple of days ago. It’s a miracle. I get in the car, turn on the wipers and I CAN SEE! That’s one reason I’m thinking fondly of my older daughter today. Another reason is that today is the thirty-fifth anniversary of her birth. Right about this time in 1980, I was counting her fingers and toes. Ten of each, in case you were wondering. She was tiny for a full-term baby – just five pounds and thirteen ounces – but she was perfect. I’m having trouble believing that was thirty-five years ago, but it was. We had some ups and downs when I was trying to get her safely to adulthood but, once she had a child of her own, she did apologize. Now we get along so well that she’s my partner in the tie-dye business. There would be no business without her; she does all the tying. I do the dyeing. I also do the bookkeeping, which is why there would be no business without me. We make a good team. We are working pretty hard right now to get ready for a festival in March, but I was thinking she would probably take her birthday off. Nope. She came over and tied a few things today, after asking me to drive her to Krispy Kreme for hot doughnuts. That was her special treat today. Yesterday it was potstickers at P.F. Changs with a friend and tomorrow it will be lamb at a favorite local restaurant with her sister. Today it was two dozen hot, fresh Krispy Kremes shared with the other members of her household and me. I ate three. I lost count of how many my fifteen-year-old grandson ate. It was a good day and she spent it wearing a headband with brightly colored felt birthday candles on it. Other ladies might wear sparkly tiaras, but that’s just not my daughter’s style. The headband was on top of her Gir hat. Yes, the character from Invader Zim. I wish I had a photograph, but my daughter is a private person when it comes to the internet. She got mad the one time I mentioned her first name in my blog. She has a secret blog of her own. Don’t try to find it. Her best friend can’t even find it. I stumbled upon it by accident, but that’s because I’m lucky. Once I confessed to finding it, she gave me permission to read it. I said I was lucky. I was lucky when she popped out about thirty minutes after we got to the hospital thirty-five years ago (I do have pictures of that but she would disown me if I put them on the internet) and I’m lucky that she’s my partner today. This entry was posted in Uncategorized and tagged birthdays, children, tie-dye on February 25, 2015 by releaf1954. When I stopped at Publix the day before my blogiversary, they only had one bunch of sunflowers in the store. 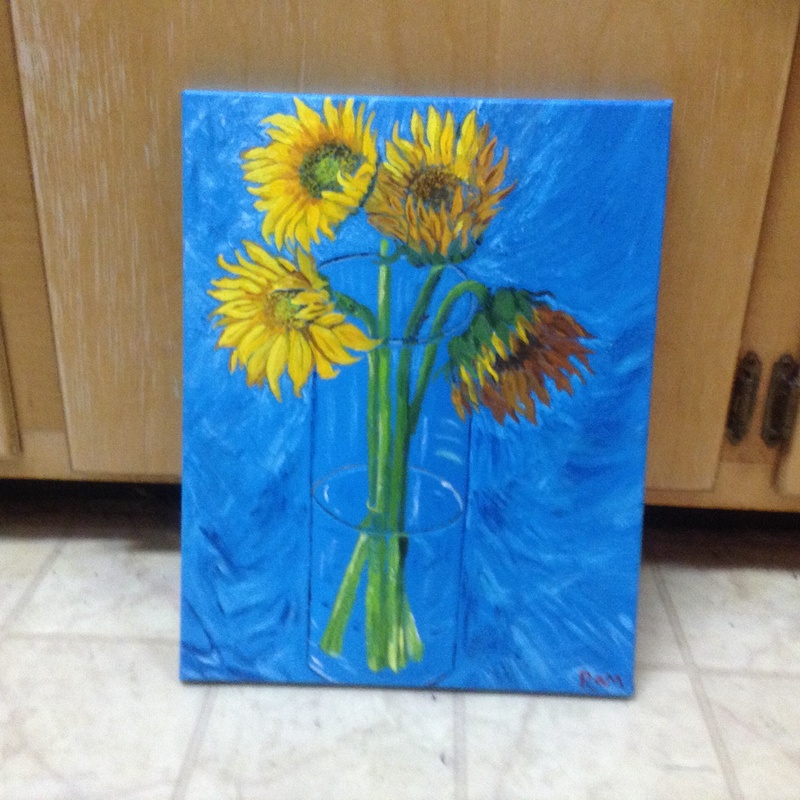 They were a bit bedraggled but I really wanted to paint some sunflowers that day, so I bought them anyway. I went back a few days later and they had restocked the sunflowers. I couldn’t resist buying another bunch. Since my first bunch had been the dark orange-yellow kind, I chose a bunch of lighter yellow ones for my second bunch. I thought I would go right home and put them in the vase with my older ones and paint them. I did put them in the vase, but I procrastinated on the painting. I had important things to do. I’m working on spreadsheets that will sort out my tie-dye inventory the way the IRS wants it sorted (FIFO) and it’s a tedious process that makes me wonder every year why I don’t just shut this business down and get a real job. Then I remember that a real job feels like death in a cubicle and I get back to work on my spreadsheets. My inner critic is happy when I’m working on spreadsheets. I wanted to paint, but I resisted painting. It wasn’t just the FIFO thing, either. I was nervous about painting. I had just finished my first whole year of painting and I had spent time in this blog congratulating myself for meeting my goal and celebrating the progress I had made. For some reason, that made it hard to start a new painting. I thought about it every day, but I didn’t do it. My flowers stayed pretty, but I knew they wouldn’t last forever. It would be a shame to have eight sunflowers in the house and let them wilt without trying to paint them. Yesterday, I finally decided what size canvas to use (16” x 20”) and I painted it purple. My daughter had set up her tying table in front of some bins, which made it a perfect place to hang a purple towel and set up my sunflowers. My usual display area wouldn’t work because the arrangement was too big. Once the purple was dry, I tried to do some sketching on it with a pencil, but it just didn’t work. I decided I needed a charcoal pencil and then I decided I didn’t want to go out in the rain to get one, so I went back to my spreadsheets. My husband got home as I was working on my spreadsheets and said he needed to go the store which must not be named (Okay, it was Walmart) to get a coffee maker for his office. He wondered if I would like to go along and I jumped at the chance, since he would be the one driving in the rain. He got his coffee maker and I got some charcoal pencils. Yes, the store which must not be named carries charcoal pencils. It was pretty late by the time we got home and I still needed to cook supper, so I waited until this morning to sketch my sunflowers. I took a couple of photographs of the set-up because I was using natural light and I had a feeling I would not be able to finish the painting before the light changed. I was right about that. This painting took me about six hours to complete. It was worth it, but the next time I try a project like this, I hope I remember to stop for lunch. 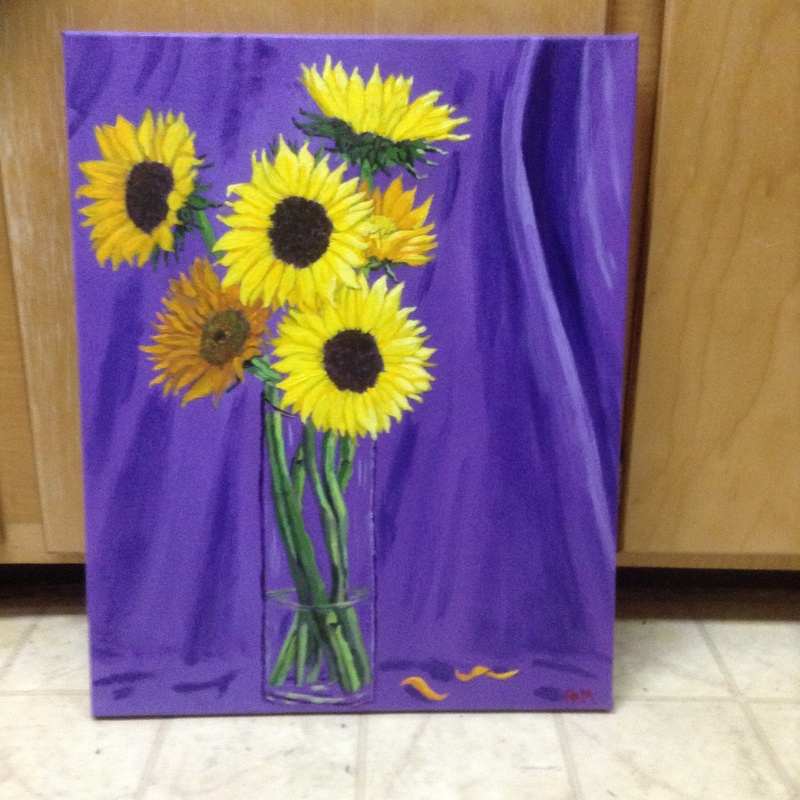 This entry was posted in Uncategorized and tagged inner critic, painting, procrastination, sunflowers on February 18, 2015 by releaf1954. I am now in my third blog year. I need to come up with a goal for this year, but I’m not quite ready to do that. I’m still celebrating my second blog year, which ended a few days ago, because I met my goal of painting fifty paintings before my sixty-first birthday. I’m not just celebrating fifty paintings; I’m celebrating progress. My biggest fear when I set that goal was that I would do all that painting and never get any better at it. My inner critic was pretty sure that was exactly what would happen. I would paint and paint and paint and my fiftieth painting would be as lame as my first. I am here to report that my inner critic was wrong. Practice does lead to improvement. Putting in the time does make a difference. 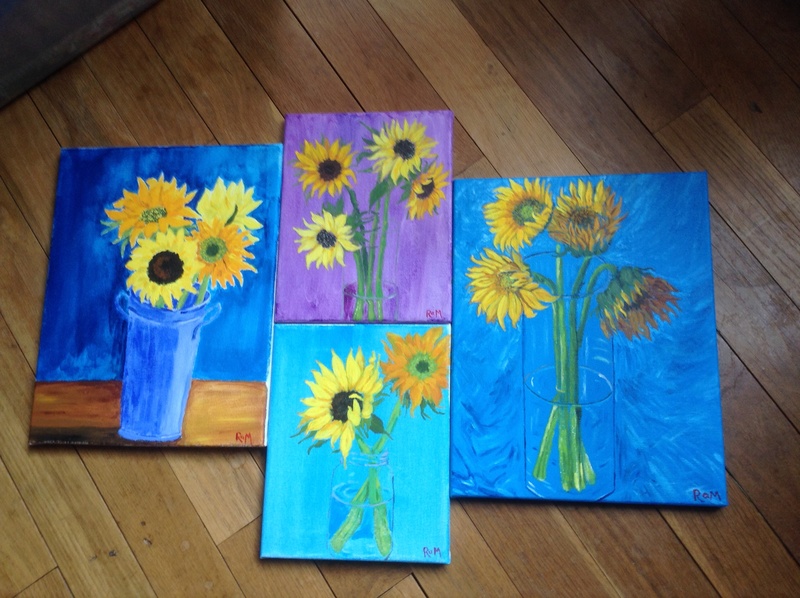 The one on the left was my first sunflower painting. The two smaller paintings came along during the year, the lower one in March and the upper one in May. The one on the right I painted last Saturday. I can look at these paintings and see that I have made progress. The last one is far from perfect but I am delighted with it because I can see that all the time I spent painting during the year was not wasted. I got better. I want to keep getting better. I want to get braver and try things that are more challenging. I know I can live with the lameness at the beginning because I know that’s just the beginning. I have to start where I am, but if I keep practicing, my skills will keep improving. I can believe this now because I spent the last year proving it to myself. This entry was posted in Uncategorized and tagged goals, painting, practice on February 11, 2015 by releaf1954. This is just a quick post on the night before my sixty-first birthday, which is also my second blogiversary, to say that I did finish my last three paintings. 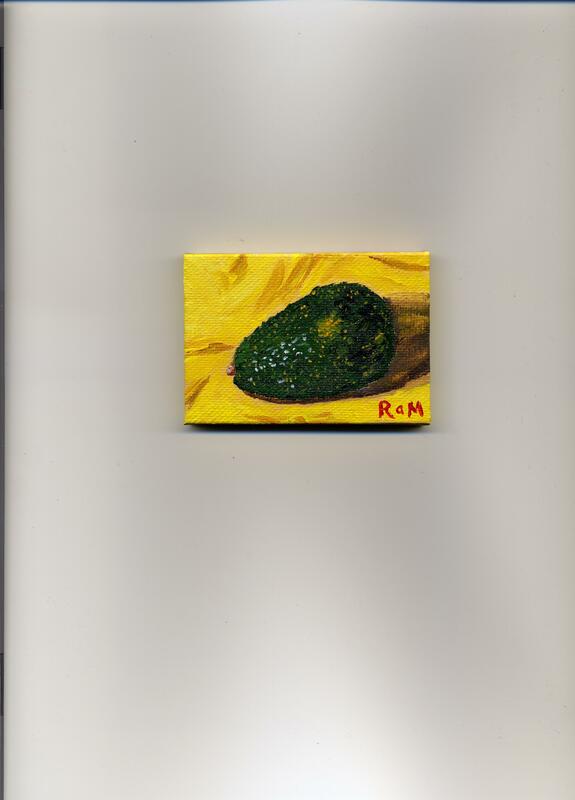 Thursday I went shopping for more canvases and then I used a tiny one for a painting of an avocado. 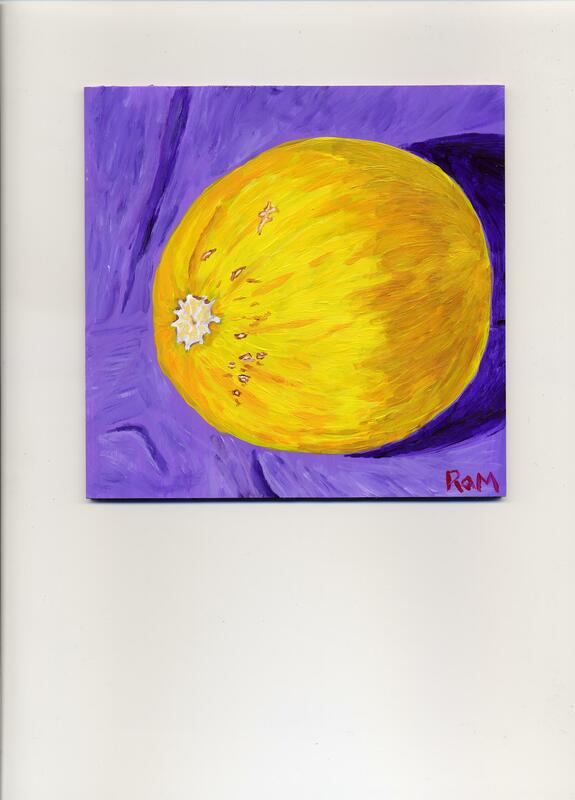 Yesterday’s was done on a 6″ x 6″ panel and it’s a golden melon I picked up when I took my daughter shopping. I thought I would get an early start today, but my younger daughter needed me to babysit for a while, so I didn’t get started until late afternoon. I still thought I would not be up past my bedtime, but I was wrong about that. I stopped at the grocery store on my way home from my daughter’s house and bought some sunflowers. The first of my paintings that I actually liked was of sunflowers, so I thought they would be a good choice for my last painting of the year. I do like this painting but it took me several hours to paint and then I had to try several times to get a picture of it. The other two paintings fit on the scanner, but this one was too big for that, so I tried my iPad and then I tried a camera and then I tried my iPad again. There still wasn’t one good picture but this one will have to do. It’s late and I want to sleep. This entry was posted in Uncategorized and tagged goals, painting, woo hoo on February 7, 2015 by releaf1954. I am closing in on my blogiversary and I am keeping up with the painting. I have used up all of my itty bitty canvases. I did not go shopping, so I did a few larger paintings, too. For my first painting of the week, I found some maple “helicopters” in my front yard and brought them to my painting space on the dining room table. 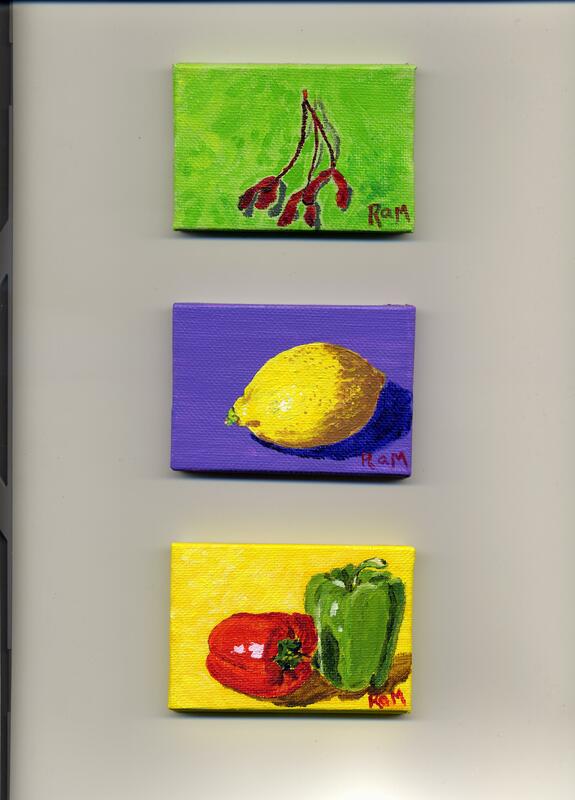 I put them on a green cloth and painted them on a tiny canvas. The next one was a lemon I got at the flea market on Saturday. I guess that means Friday was the day I didn’t paint. It’s okay; I doubled up another day. I also picked up two peppers when I was at the flea market and I painted those on Sunday. 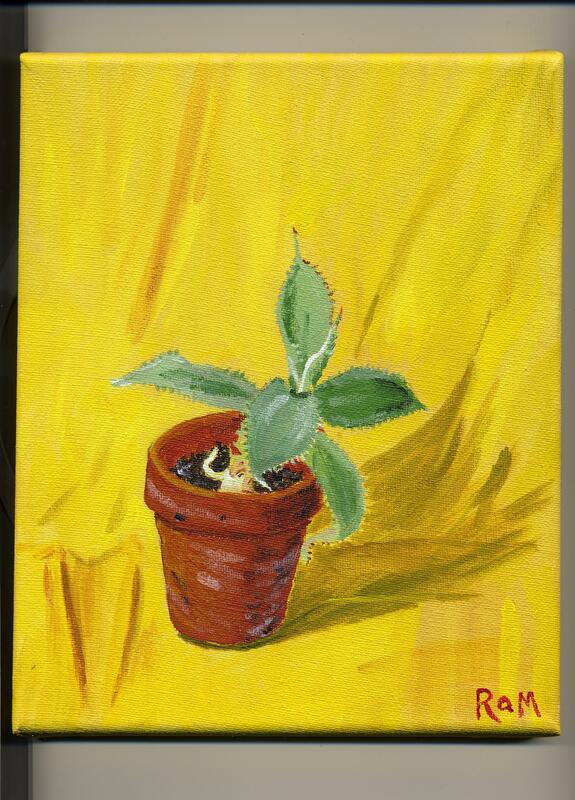 The next day, I used a bigger canvas and painted a succulent in a small clay pot. We have a lot of succulents around here; they reproduce like rabbits. The following day, my daughter needed me to take her to Target, so I browsed the produce department there, looking for something that would be fun to paint. I swear the Bosc pears looked pretty when I picked them up at Target. They don’t look pretty on this canvas. 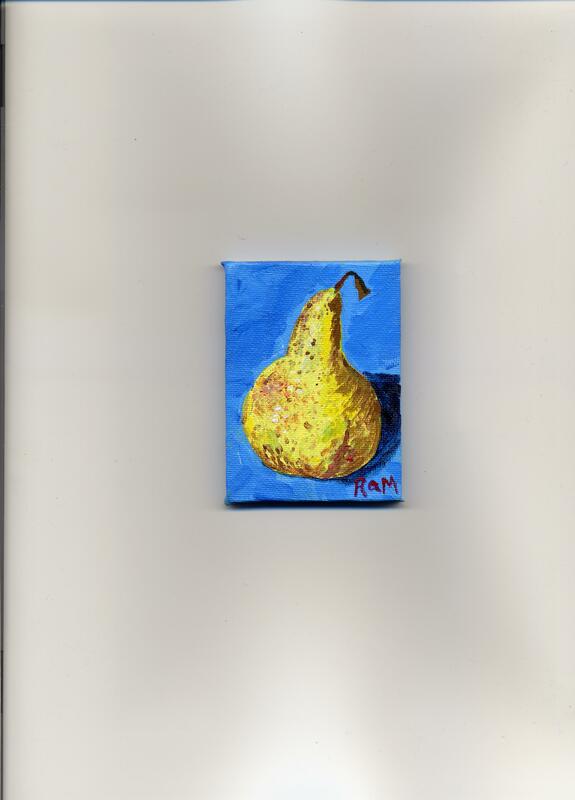 I was so frustrated with the way they turned out that I took my last tiny canvas and I painted one of them again. I think I do like the little painting a bit better than the big one. Today, my daughter needed to go to Publix. That produce department had plenty of nice vegetables in it, but I was uninspired until my daughter suggested a purple cabbage. Purple. I hadn’t done a purple vegetable in ages. I decided to give it a try. 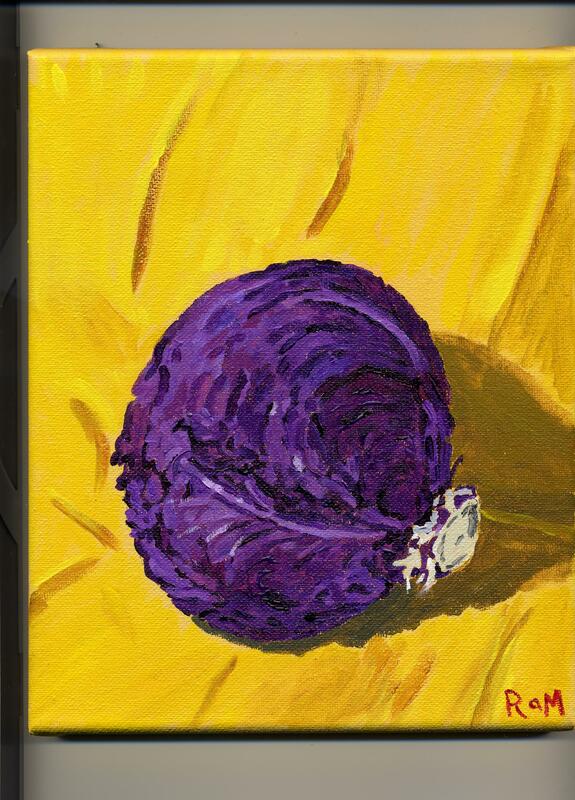 Okay, it’s just a painting of a big, fat purple cabbage, but I like it. The cabbage is painting number forty-seven. I just need three more to meet my goal. Today is Wednesday and my blogiversary is Sunday. I think I can do this. 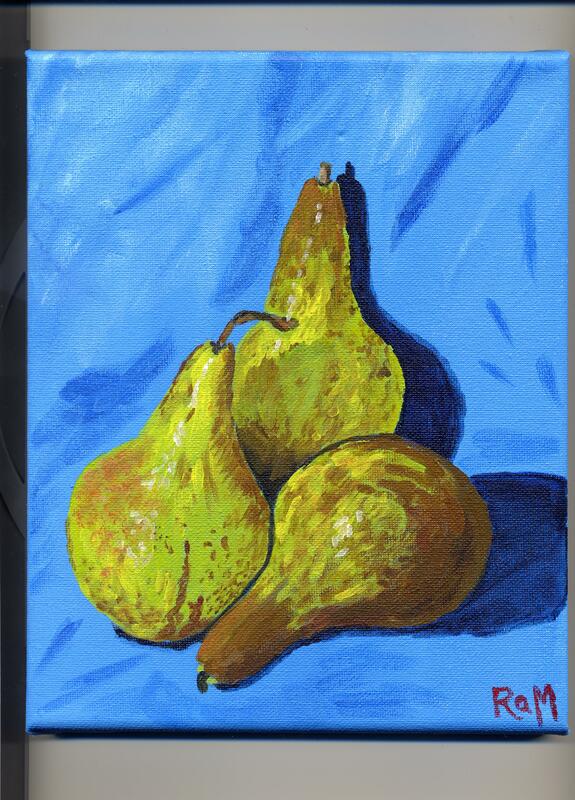 This entry was posted in Uncategorized and tagged goals, painting, vegetables on February 4, 2015 by releaf1954.